I made another stop at Admiral Cheng-Ho for lunch on my way to my regular volunteering gig at Fareshare. This time I decided NOT to have the fritters, even though I love them. I ordered the African Beans instead. They came with good sourdough toast, avocado and an almond feta. The beans themselves were OK, but really I’d have to class this as my first food disappointment at Admiral Cheng-Ho. I didn’t really like the spicing and there were some lurking bits of not very well cooked eggplant. To be fair, I have a complete terror of undercooked eggplant. But I could forgive those small failings because the beans were utterly lifted by the beautifully smooth and tart almond feta that came with them. I’m happy to see that the feta appears in a few other items on the menu too. If I had this dish again though, I’d ask for the toast on the side as it was pretty soggy and I hate soggy toast. And I actually didn’t like the coffee. But the range of dishes was amazing so I’ll definitely go back to work my way through the menu! Yeah that feta is great! I’m surprised you didn’t like the coffee. I’ve never had a bad one there. Almond feta sounds interesting! What does it taste it? I am thinking of volunteering at Fareshare, went online to their site, but it looks like theres a waiting list for it. Do you have any other recommendations for places I can volunteer at? Thanks! The almond feta is good. Fareshare is my only volunteering, so I don’t have other recommendations Felicia. Sorry. Yay, I love the idea of the vegan norm. 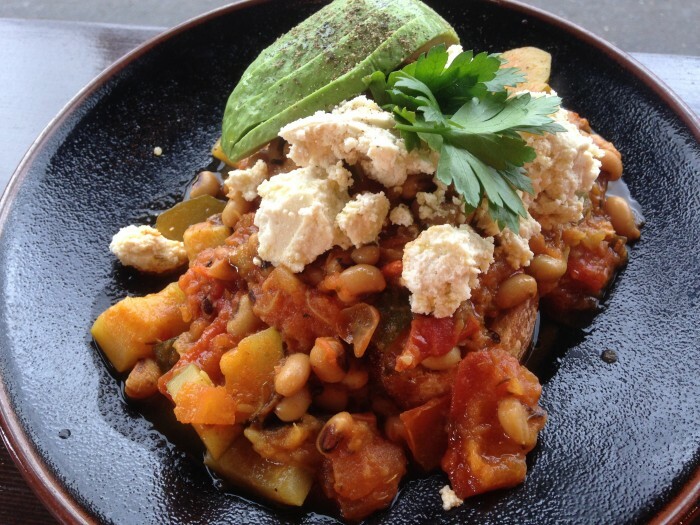 Shame about the beans, the almond feta sounds amazing. I need to get back there soon. Thanks for sharing! Feta was just great. Partly my fault with the beans, I don’t really much like north African spicing so I probably shouldn’t have ordered it. Other people have said they loved it. But for me it is hard to go past those zucchini fritters.